Christina Engelbart has written an excellent summary of her late father’s (Doug Engelbart’s) ideas, and has outlined what’s missing from digital media. 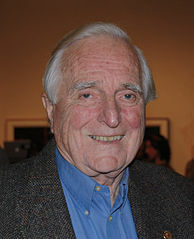 Doug Engelbart was recognized as a great pioneer of interactive computing. Most of his dozens of prestigious awards cited his invention of the mouse. But in his mind, the true promise of interactive computing and the digital revolution was a larger strategic vision of using the technology to facilitate society’s evolution. His research agenda focused on augmenting human intellect, boosting our Collective IQ, enhancing human effectiveness at addressing our toughest challenges in business and society – a strategy I have come to call Bootstrapping Brilliance. If, in your office, you as an intellectual worker were supplied with a computer display, backed up by a computer that was alive for you all day, and was instantly responsive to every action you had, how much value could you derive from that? I got the news from Howard Rheingold on Google+ that Doug Engelbart died last night. It is not a stretch to say that without Engelbart the experience we’ve had with computers for the last 30+ years would be very different. He was a pioneer in interactive computing, bringing computers out of the era of batch processing with punch cards and teletypes as the only means of using them, into an age where you could directly interact with one. He wanted so much more to come out of that, and he put that desire into his NLS system. He is best known today as the man who invented the computer mouse, but in my opinion that makes light of what he did. He gave us mouse interaction with a graphical interface. He gave us the idea of using a visual pointer (he called the visual pointer a “bug”–a little something that flies or crawls around the screen…) and information schemas that one could change on the fly to manipulate and organize information, and to save that information to your own personal file so that you could later retrieve it, and share it with others in your group. He gave us hyperlinking, long before most of us understood what the concept was. His hyperlinks were more than what we have today. They not only pointed to information, but also specified how the creator of the link wanted that information displayed. He gave us a mixture of graphics and text on the screen at the same time, to enhance our ability to communicate. He gave us the idea of sub-second access to information, so that our brains could be “in flow,” and not have mental breaks with our thoughts, because of slow technology. He gave us collaborative computing with video conferencing. In an amazing display, when he demoed NLS, he brought in other participants, using a combination of analog technology, and a digital network, who could work with Doug on the same document, live, at the same time. Using video cameras, television displays, and microphones, and speakers, they could see each other, and talk to each other as they worked. During the 1960s he thought about word processing at a time when it was just experimental, and how the idea could be used to make forming documents easier. He thought about online discussions, address books, online technical support, and online research libraries. He brought some of what he thought about into NLS. If you’d like to watch the full presentation, you can look through an annotated version here. All of this was created in 1968, before the Arpanet, the predecessor to the internet, came into being. The audience that saw this demo was dazzled. Some questioned whether it was real, whether it was all a mock up, because hardly anybody expected that computers could do these things. Another computing pioneer, Chuck Thacker, said of Engelbart that day that he was “dealing lightning with both hands.” Indeed he did. Smeagol Studios came up with what I thought was a nice video summary of Engelbart’s work, and how it was expressed in products that we in the mass market came to use. Thank you, Doug, for all that you gave us. You took a great leap in making computers approachable, which helped me fall in love with them. Doug Engelbart and Ted Nelson come to dinner – This happened on Engelbart’s birthday last year. Howard Rheingold invited Engelbart and Nelson over, and just had them chew the fat on what they thought of the web. More on getting beyond paper and linear media – Christina Engelbart, who is one of Doug’s daughters, and the director of the Doug Engelbart Institute, wrote a follow-up post to “Getting beyond paper and linear media,” on her blog, Collective IQ, talking about Doug’s concept of augmenting the human intellect.